West Indian Cricket Team will be sponsored by Digicel until September 2016. With this latest announcement, combined with the news that Digicel is a major sponsor of the inaugural Caribbean Premier League this summer, Digicel is further expanding its commitment to cricket in the Caribbean as part of its on-going commitment to the resurgence of the Caribbean’s favourite sport. Digicel’s renewed contract sees the company retain its title as team sponsor, which includes all the marketing and branding rights for the team, and was signed on Monday 3 June at the company’s regional headquarters in Kingston by Digicel Group CEO, Colm Delves and West Indies Cricket Board President, Whycliffe ‘Dave’ Cameron. 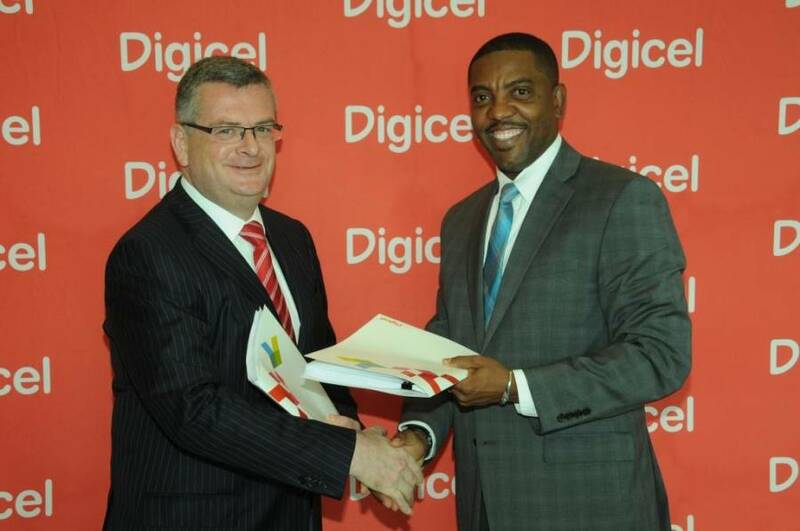 Digicel Group Head of Sponsorship, James Wynne, said; “Cricket is synonymous with the Caribbean and as such, we are thrilled to have completed this contract agreement which sees Digicel retain its sponsorship of the West Indies cricket team. The agreement, together with our sponsorship of the CPL and our far-reaching youth programme, ensures Digicel’s support of the game is focused on maintaining the ongoing popularity of the game in the region, for generations to come. “Looking forward, our goal is to be centrally involved in the development of cricket so that the region’s young talent can play competitively here at home. As such, over the next three years we will be focused on supporting the WICB and the CPL in the development of cricketing talent among all age groups,” concluded Wynne. This news also comes on the back of Digicel’s individual sponsorship of Jamaican all-rounder, Marlon Samuels, which was announced last week and is one of several individual players signed by the main cricket sponsor in the region. Digicel has also been announced as major sponsors for the upcoming WICB partnership with CPL Ltd. Beginning on 30 July, the Caribbean Premier League is a T20 cricket tournament that aims to showcase the beauty and cricketing talent of the Caribbean to the world. The best cricketers in the West Indies will play alongside their international counterparts, coupled with the carnival atmosphere for which the Caribbean is world-renowned. The CPL is expected to draw millions of viewers from around the globe as six franchise teams from across the region battle it out for a place in the final on 24 August in Port of Spain, Trinidad and Tobago.